Amtrak is marking its 47th anniversary. The first train operated by Amtrak was "The Clocker" from Philadelphia to New York on May 1, 1971. WASHINGTON — Amtrak is marking its 47th anniversary. The first train operated by Amtrak was “The Clocker” from Philadelphia to New York on May 1, 1971. Amtrak was created by the Rail Passenger Service Act, signed by President Richard Nixon on Oct. 30, 1970. Twenty railroads eventually opted to participate in the formation of Amtrak, turning over their passenger services to the new company. According to Amtrak’s online timeline, service that would eventually become the heavily-used Northeast Corridor between Boston and Washington, D.C., began as “Metroliner Service,” with 14 daily runs from New York to Washington and 11 between New York and Boston. By 1983, Amtrak claimed to have attained 43 percent of air-rail market share between Washington and New York. Amtrak had a record year in 2017 for ridership and revenue. Its trains carried 41.7 million passengers, up 1.5 percent from 2016. Revenue rose 1.1 percent to $3.2 billion. The Northeast Corridor, between D.C. and Boston, served 12 million riders — the most ever. 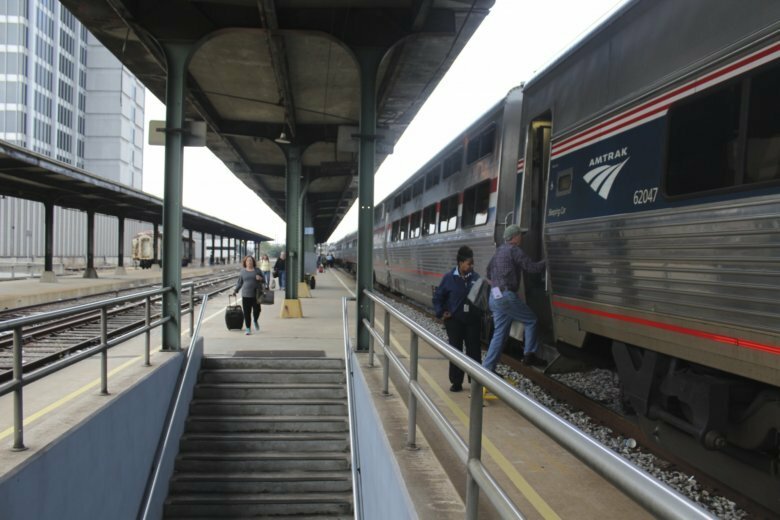 Amtrak is currently investing $22.4 billion in updating its Acela service and on extensive renovations and Union Station.